A survey of nearly 11,000 employees by Blessings White showed that only 31% of those surveyed stated they were engaged at work. That means 69% are not engaged and when you’re not engaged you probably don’t like what you do! If you don’t like your job … it is NOT the responsibility of your boss, your company, or anyone else to make you happy … it is up to you! You could quit, walk away, throw in the towel, surrender, give in, and find a position that is better suited for you, your values, and your needs. You could stay put stay where you are and keep focusing on what you don’t like, what’s wrong, and what other folks should be doing so you can be happier at work. You could shift your perspective and what you believe about your work. Want to be a little happier at work? 7 things that you could do to improve your happiness level @ work:. Focus on what works and what is good about your job. Make a list of all the things you are able to buy with your paycheck for you and your family. List all the reasons you’re a good fit for this job. When you are at work … work … and when you are at home, be home and focus on your family, friends, and the other things that make you happy. Answer this question: If I was giving a 110% effort at work what would I be doing … and then do it! Set a target productivity level, a sales goal, or a promotion, and then focus all of your energy on achieving that target. Set a realistic time frame to accomplish your target. And when you hit them, one of 3 things will happen: a) You will be rewarded for your achievements. b) You will be happier simply because you were more focused and more productive. c) You will be crystal clear that you need find a position and a company that works better for you. When it is all said and done, nobody is responsible for your happiness at work. 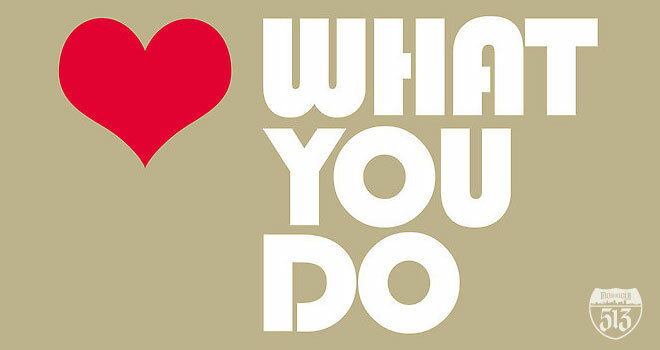 The decision to love what you do is up to you … so choose wisely and choose often.